CHICAGO CRAFT BEER WEEK AND GINO’S BREWING CO. 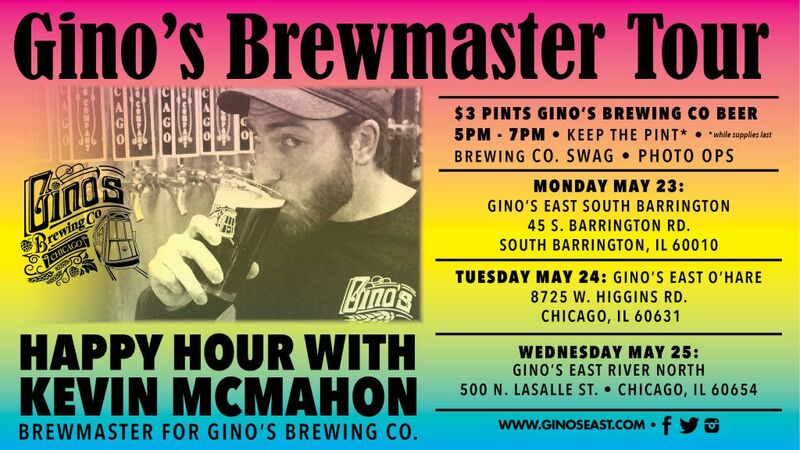 The award-winning Gino’s Brewing Company is celebrating Chicago Craft Beer Week with a Meet the Brewer Happy Hour at Gino’s East South Barrington (45 Barrington Road) on May 23, Gino’s East O’Hare Plaza (8725 W Higgins Road) on May 24, and Gino’s East River North (500 N. LaSalle) on Wednesday, May 25 from 5 – 7 p.m. 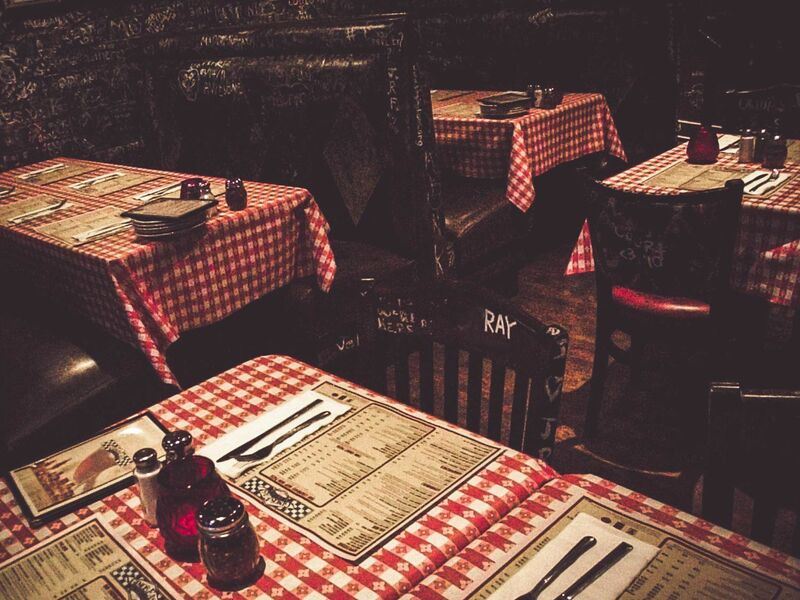 Guests will enjoy great Gino’s Brewing Company pint glass and swag giveaways, Gino’s East food to order, plus live acoustic music at the Gino’s East River North location only. 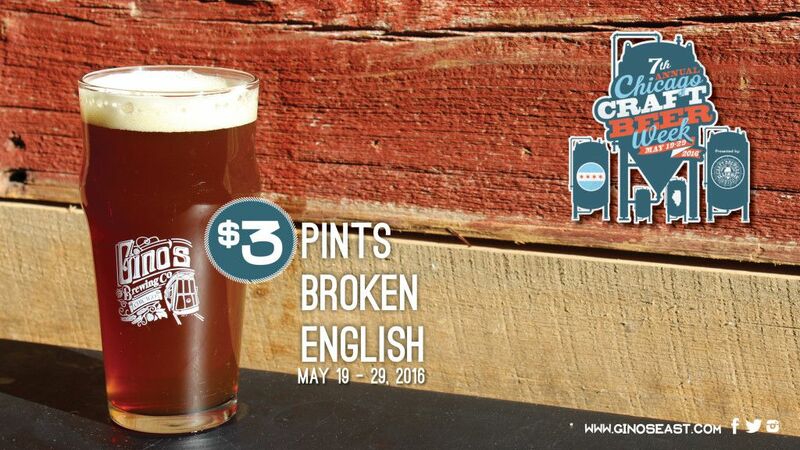 In addition to the Meet the Brewer events, participating Gino’s East locations- including Gino’s East River North, Gino’s East Superior Street, Gino’s East South Loop and Gino’s East St. Charles- will offer $3 pints of Gino’s Brewing Company’s Broken English, while supplies last, daily throughout Chicago Craft Beer Week. Since launching in February 2015, Gino’s Brewing Co. has taken the craft beer market by storm, winning four coveted awards in the 2015 U.S. Open Beer Championship, beating out nearly 4,000 submissions to win the Gold Medal for LaSalle St. Lager in the Munchner Helles category; the Silver Medal in the Extra Special Bitter category for Broken English; the Bronze Medal for Killarney Connection in the Foreign Stout category; and the Bronze Medal for Gino’s Pale Ale in the Belgian Pale Ale category. Fans may also catch brewmaster Kevin McMahon pouring his award winning brews at Beer Under Glass, the kick-off event to Chicago Craft Beer Week, on Thursday, May 19 at the Garfield Park Conservatory (300 N. Central Park Ave) as well as the Welles Park Craft Beer Fest, also known as Chicago’s largest craft beer party in the park, on Saturday, May 28. For more information or to purchase your tickets visit http://chibeerweek.com/.